The crew of Mat-TV rush around the studio trying to get ready before they go live. They learn that some of the microphones are not working, so they grab some other mics that do work. As the last-minute preparations finish, the director calls for the everyone to stand by, and starts the count down. Now there’s no turning back. They’re live at 10 a.m., ready or not. Once the show begins, the floor manager gives the host the cue to start speaking. The half-hour duration of the show is filled with video clips made by members of the crew and interviews of four guests. While the first video plays, the crew readies the audio for the interview portion. The host and guests sit patiently in front of the cameras for their time to speak. The floor manager signals to the host to start the interview, and at 10:30 he or she signals the host to wrap it up. At the end of the show, the screen fades to black. 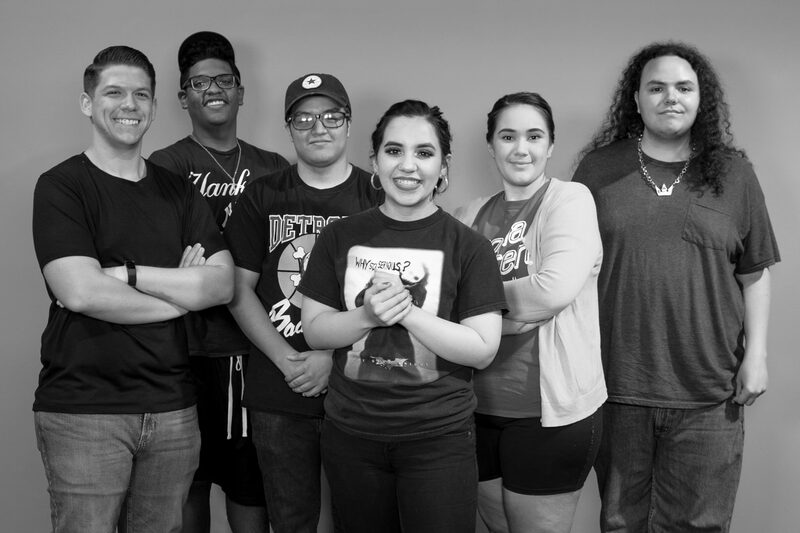 The crew consists of Arizona Western College students majoring in Television and Media. The show goes live every Wednesday morning. Sherry Needham, director of Television Services, says that Mat-TV is a student-run show meant to give students a chance to take what they have learned in class and apply it while also fulfilling their internship or independent study requirement for their degree. The students get an opportunity to learn about the various roles there are in TV work. The director of Mat-TV, Qadri Land, learns about running a show. His reasonability is to make sure the show is ready before going live and then to keep everything running smoothly. Amanda Gill, the host, introduces the show and the video clips, and she interviews the guests. She has been a part of Mat-TV for three semesters. That floor manager is Olivia Owen, whose task is to oversee the studio floor by prepping the cameras and helping to ready the set. During the show, Owens receives word from the director when to signal the host that they are live and when to conclude the show. Emmanuel Huizar, the audio technician, makes sure that the sound is balanced and ensures that everyone who is going to speaking on camera has a microphone. Mat-TV gives students an opportunity to learn about the various roles that are available in television. The students get practical experience performing those roles in a live weekly production.